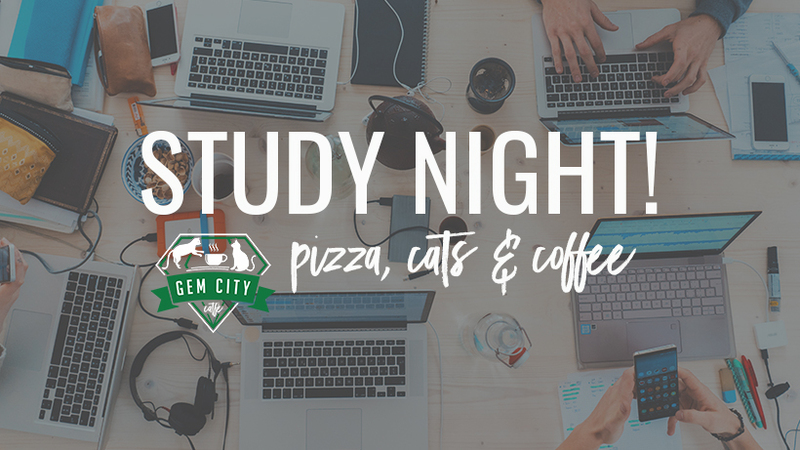 Prep for finals with pizza, cats, and coffee! From 5 - 9 PM on Mondays, starting the 26th, we’ll be hosting a study night! Drop in to spread out upstairs with free WIFI, bottomless drip coffee, and pizza for sale by the slice from Pizza Factory. For students with valid student ID, you can take a free 5 minute study break per hour by popping into the cat lounge (with purchase of any food or drink!) If you’re over 21, reward your hard work with some wine or a cocktail!